Leipzig, Leverkusen, Köln and Schalke made waves on Matchday 6, with a delighted Arnold Schwarzenegger watching on. FC Köln terminated FC Bayern München's 100 percent start to the season thanks to a predatory strike from Anthony Modeste at the Allianz Arena. And looking on from the stands on Oktoberfest weekend was none other than Arnold Schwarzenegger. “I am 69-years-old and this was the first time I had a chance to attend a game here,” the actor and former politician explained. “It was a fantastic game… a really exciting match,” he added. Still unbeaten in 2016/17, the Billy Goats responded to going behind to Joshua Kimmich’s sixth goal in seven games for club and country and the visitors could have stolen all three points at the death in what almost turned out to be a Raw Deal for the hosts. Anyone? Click here for the Bayern v Köln Match Centre. The Bundesliga is alive with the sound of RB Leipzig. 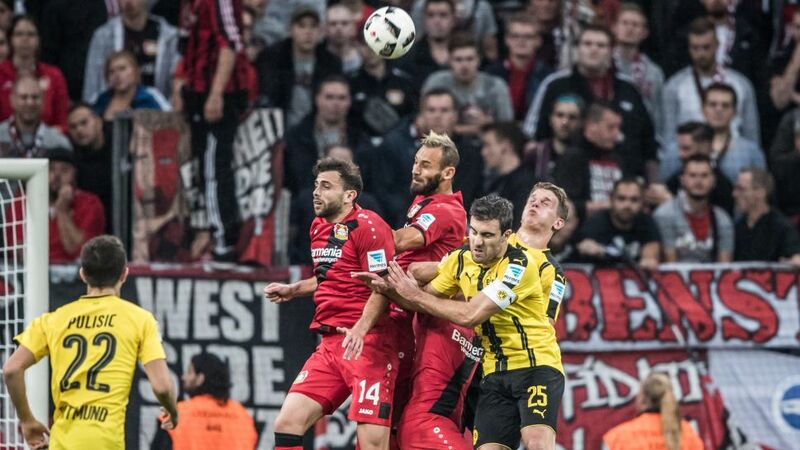 The first team from the former East to grace Germany's top-flight since FC Energie Cottbus, Ralph Hasenhüttl's young and exciting charges entered the record books this weekend. A 2-1 victory against FC Augsburg at the Red Bull Arena meant Leipzig extended their unbeaten start to six games, a new high for Bundesliga debutants. "We'd have bitten your hand off for 12 points from six games before the start of the season," defender Marvin Compper enthused after Leipzig's players and fans celebrated in unison following Friday's win. "We also know the last games could have gone differently," midfielder Dominik Kaiser warned, the captain seeking to rein in speculation as to where all of this might end. Recently-departed Bayern coach Pep Guardiola instigated a tactical revolution with his tiki-taka football at FC Barcelona between 2008 and 2012, winning 14 major titles. However, as his successor Carlo Ancelotti discovered to his avail against Köln on Saturday, it seems the good ol' fashioned No9 is back with a vengeance. Modeste's equalising goal saw him become the fifth player to score five goals already in 2016/17. The other four? Pierre-Emerick Aubameyang, Chicharito, Vedad Ibisevic and Robert Lewandowski - to a man, players who lead the lines for their clubs playing on the shoulder of the last defender.